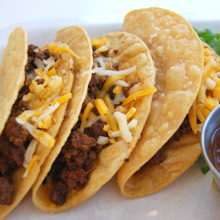 3 Tacos per order: Choose from homemade flour, corn or wheat tortillas. Served with rice and your choice of un-refried pinto or whole black beans. 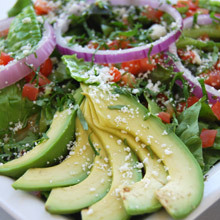 Substitute a jicama side salad, cup of soup or fruit cup for rice and beans. Ground Turkey or Beef sautéed with seasonings and fresh vegetables. Served with cheese, pico de gallo and salsa roja. Your choice of marinated and grilled fajita beef or chicken with grilled peppers and onions, cheese, pico de gallo and salsa roja. 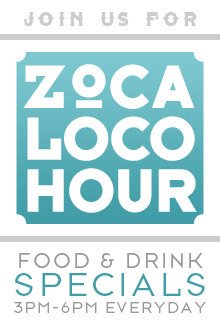 Your choice of slow roasted pulled pork or slow cooked green chile chicken with pico de piña and salsa verde. Your choice of grilled Mahi Mahi or grilled shrimp with cabbage and carrot slaw and Mango-Watermelon salsa. Grilled peppers, onions, mushrooms, avocado, pico de gallo and salsa roja. Served with rice and your choice of un-refried pinto or whole black beans, unless otherwise stated. Our house specialty! Grilled chicken and crispy corn tortilla strips tossed in our creamy verde sauce. Served on a bed of black beans with sour cream, tomatoes, cilantro, and queso fresco. Crispy corn tortillas layered with your choice of ground beef and Ranchero Sauce or slow cooked green chile chicken and Tomatillo Sauce, topped with jack cheese, lettuce, tomato, sour cream and queso fresco. 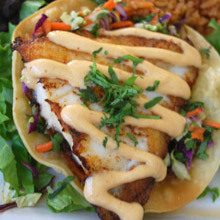 Filet served over a crispy corn tortilla with grilled tomatoes, cabbage and carrot slaw and Chipotle Cream Sauce. 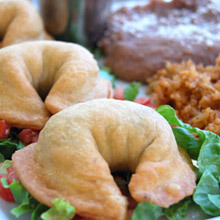 Three delicate homemade empanadas filled with your choice of pulled pork, green chile chicken, or sauteed vegetables. 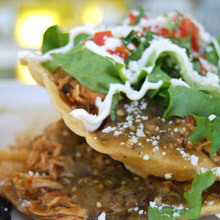 Traditional fried corn tortillas filled with slow-cooked green chile chicken, served with our salsa verde and sour cream. 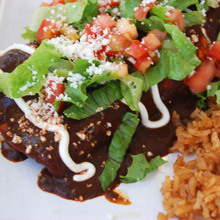 A large flour or wheat tortilla filled with meat of your choice or veggies, un-refried pinto or whole black beans and jack cheese, smothered in ranchero or salsa verde and topped with lettuce, tomato, queso fresco and sour cream. Served with a side of rice. Hearty vegetable stew served over rice with a side of un-refried pinto or whole black beans and your choice of homemade flour, corn or wheat tortillas. Traditional Mexican sandwich with your choice of ham, pulled pork, green chile chicken, fajita beef or fajita chicken. Made with black beans, queso fresco, lettuce, tomato, avocado, sour cream and roasted jalapeños. Served with rice. Traditional Mexican sandwich with grilled veggies, black beans, queso fresco, lettuce, tomato, avocado, sour cream and roasted jalapeños. Served with rice. Salsa roja and salsa verde served with homemade tostadas. Avocado, tomatoes, onions, cilantro, jalapeños and lime wedges. Mix it the way you like it! Shrimp, scallops, mixed peppers, onions and cilantro in a sweet and spicy cocktail sauce. Served with crackers. and jalapeños. Served with crackers. White cheese blended with roasted peppers and spices. Campechana, 4 Flautas, 2 Empanadas, queso, guacamole, sour cream, and pico de gallo. 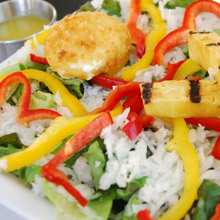 Red and green leaf lettuce with red and yellow bell peppers, jicama and grilled pineapple. Topped with tortilla-crusted goat cheese. Served with Jalapeño Honey vinaigrette. Jicama, carrots and cucumber tossed with our Jalapeño Honey vinaigrette, topped with chopped cilantro. Traditional homemade chicken soup with avocado, grilled corn and tomato, topped with tortilla strips and jack cheese. Slow roasted pulled pork with poblano peppers, tender posole and cilantro. Served with corn tortillas. Traditional black bean soup topped with sour cream & green onions. 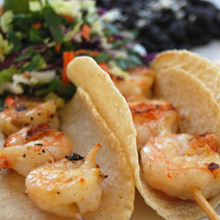 Choose from homemade flour, corn or wheat tortillas. Served with rice and your choice of un-refried pinto or whole black beans. Substitute a fruit cup for rice and beans. All children’s plates include your choice of beverage. Lightly fried Mexican pastries covered with cinnamon and sugar, served with chocolate and sweet cream. Traditional ‘three milks’ creamy cake served with whipped cream, toasted coconut flakes and strawberries. Served in a cinnamon tortilla topped with caramel sauce. All recipes prepared with zero trans-fat oils. All tortillas, salsas, beans and rice are prepared in house with no animal products.